Amy Roloff, star of TLC’s hit show “Little People Big World” and celebrated author, is joining local improvisation group “The Unscriptables” for the 1st Annual Home Sweet Home Hullabaloo – an evening benefit performance of comedy, great food and community on Thursday, September 9, at Cheatham Hall in Portland, Oregon, at the World Forestry Center. Proceeds from the event support JOIN, a local Portland organization dedicated to helping homeless individuals, couples, and families transition from the chaos of the street to the comfort and stability of permanent housing. 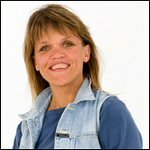 Amy Roloff, who was born with dwarfism, established the Amy Roloff Charity Foundation.